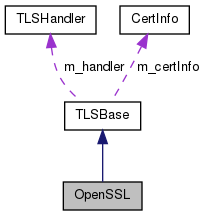 This class implements a TLS backend using OpenSSL. Definition at line 41 of file tlsopenssl.h. Definition at line 27 of file tlsopenssl.cpp. Definition at line 54 of file tlsopenssl.cpp. Definition at line 114 of file tlsopenssl.cpp. Definition at line 79 of file tlsopenssl.cpp. Definition at line 65 of file tlsopenssl.cpp. Definition at line 201 of file tlsopenssl.cpp. Definition at line 93 of file tlsopenssl.cpp. Definition at line 102 of file tlsopenssl.cpp.